Release forms protect film and video makers from potential legal trouble, and also set forth the terms and conditions in which the people in the video agree to participate (these people are typically actors in fictional films and videos, and normal people in documentaries). Not every indie filmmaker has the budget to consult with an entertainment lawyer though, so it’s not uncommon to be confused about when you need a release form for filmmaking. We’re going to run through a series of scenarios in this article, and talk about when and why you might need to use a release form for filmmaking or video making. As always, we’re not entertainment lawyers ourselves this is certainly not legal advice but we hope it helps you think about these issues from a more informed perspective. When do you need to use a release form for filmmaking and video making? Do I need a release form if I’m just making a video with some friends? It depends on what you’re going to do with the video afterwards. If you’re just making it to share with other friends and maybe put on the internet, make sure that everyone is on the same page and that you all discuss what your plans are for distributing the video afterwards (online publicly, on Facebook, via a secret link or unlisted YouTube video, etc). If anyone has any doubts, make sure to ressolve those before proceeding. If you’re considering making a short film with the possibility of entering it into film festivals and so forth, be sure to get release forms. You can download release forms for short films here. Are release forms needed for making a short film? Yes! Even if you’re just planning to put the film online afterwards, you should always get release forms signed by your actors. This is an important step because it protects you as the filmmaker and also makes clear how the film may be distributed. Let’s say your short film is a hit– what happens if a big movie studio wants to turn it into a feature length film and one of your actors comes to you asking for a portion of the proceeds, even if they won’t be in the full film? And even if that doens’t happen, all sorts of scenarios can arise and that’s why it’s important to get release forms signed before you begin shooting your short film. Here are some release forms for short films. Do I need a release form for a school project or class project video? If you’re making a video for science class in high school that will only be shown to your classmates, you probably don’t need any type of release forms for that. If however you’re in film school and you’re making a short film for an assignment (and you might end up using that film in other ways such as entering it in film festivals afterwards or posting it online) it’s a good idea to get release forms signed from your actors in advance. Here are some release forms for short films that you can use. Do I need a release form for shooting people out in public on the street? If you’re making a film or documentary and you’re shooting “man on the street” interviews or “vox pops” with passerbys where you ask them a question to get a sense of what the “common man” or woman thinks of an issue, you should get a release form signed. Download a release form for that here. If you’re filming a child at a playground or any minors in general, you almost certainly should get a href=”https://downloadreleaseforms.com/filmmaking/documentary-film-release-forms/”>release forms signed by the parent or guardian of that minor (our release form kit includes a special form for parents to sign on behalf of kids under age 18). If you’re filming individuals whose faces are not recognizable in public, you almost never need to worry about getting a release form (such as a crowd shot, or people walking down the street, or a blurry shot or a shot of people’s feet, etc). Do I need a release form for filming an event like a wedding or church service? Get documentation in writing from the owner of the venue (such as the pastor of the church) that you have permission to film the event on that day and use that footage in your project or film. Post a reasonably sized sign at the door(s) that attendees can’t miss stating that they will be filmed and giving an indication of what the filming is for (we include an example sign template that you can modify in this release form kit). Be sure to film a shot or get a photo of this sign showing people walking past it to illustrate that the sign was posted and publicly visible and hard to miss. If possible or practical, have the event organizers make an announcement at the beginning explaining that the event is being videotaped for xyz purpose and that if anybody does not want to be filmed, to let your camera person know. Most of the time nobody will, but if anybody does, make sure the camera person gets a photo or video clip of that person so your video editor knows to make sure they’re not included in the final edit. If you’re a videographer shooting a wedding for a client, most of the time posting a sign at the door will be fine, as people in this day and age expect to be filmed or photographed at weddings. Do I need a release form if I’m filming a demonstration on the street? Generally speaking no. The people you are filming are in a public place taking part in a public demonstration. They have no expectation of privacy. If you get a vox pop or “man on the street” or “woman on the street” interview with an individual, it may be prudent to get a release form signed by them. Do I need a release form for a documentary interview where the subject has clearly consented to being filmed? Yes. If you are making a documentary film or video and you are interviewing someone you always need to get a release form from them. Even if it’s obvious that they consented to being filmed. Here is the appropriate release form you need to obtain their signature on. Do I need a release form for filming employees? If you’re making a corporate training video we recommend getting release forms signed even if the people being filmed are your own employees. This establishes what the footage can be used for and can avoid any confusion or disagreements down the road in case you want to use the footage for advertising purposes, PR or other reasons later on. If you’re making a documentary style video and you have the consent of an employer to film in their workplace you still need to get release forms signed by their individual employees that you film because an employer cannot consent on their employees behalf. Here is the appropriate release form you need to obtain their signature on. Do I need a release form for filming in a school? Yes. You will need to have signed release forms for every student and adult you film with inside a school. There’s a catch though: minors under age 18 cannot sign release forms on behalf of themselves so instead their parents or guardians will need to sign the forms on their behalf. Depending on the school district, some schools may have pre-signed release forms for all their students at the beginning of the year and can decide on behalf of students whether or not to give them to filmmakers, thus allowing them to participate in a video project. In other cases you will need both to get teachers to distribute release forms to all the students who will have their parents sign them and also get separate permission from the school’s principal to film on the premises. Our documentary film release form kit includes a release form for minors that parents and guardians can sign on the students’ behalf. Students over age 18 can sign their own release forms. Do I need a release form for filming children in public? Yes, always, even if they are in public. Our documentary film release form kit includes a release form for minors that parents and guardians can sign on their behalf. Do I need a release form for filming crowds? In the United States, people on public property (streets, sidewalks, etc) are legally considered to have no “reasonable expectation of privacy,” meaning they can generally be filmed. Crowds at major sporting events may be a different matter if they are on private property, eg a sports stadium. Many professional sports leagues are quite litigious and have extremely restrictive rules on filming at their events in general. Do I need a release form for filming in a courtroom? Generally courtrooms are considered public places though from municipality to municipality (and sometimes even from trial to trial) the rules will differ on whether filming is allowed at all. In most instances, getting a release form from courtroom participants would be nice but is not necessary. Call to ask the court clerk’s office whether or not filming is allowed for a specific trial before you show up with a camera. Do I need a release form for filming in a park? If it’s a publicly owned park in the United States, then people will generally have no reasonable expectation of privacy. However if you’re filming kids at a playground, you will need to have release forms signed by their parents. Our documentary film release form kit includes a release form for minors that parents and guardians can sign on the children’s behalf. Do I need a release form for filming in a hospital? As a general rule of thumb, you should err on the side of caution when filming anybody in a sensetive situation, and that definitely includes people who are hospitalized. As a filmmaker or video maker you should definitely get release forms signed from anybody you film inside a hospital. You may also need to get permission of the hospital to film there, depending on the circumstances. Do I need a release form for filming stock footage? Yes, you will need to get talent or model release forms signed by individuals you are shooting for stock footage. Some stock footage sites may allow you to sell footage of crowds that are not released but they may restrict your selling options for “editorial use only” meaning nonfiction content, instead of use in advertising or for other purposes. For commercial purposes, all recognizable persons should sign release forms. Do I need a release form for filming in prison? Wards of the state, such as convicted prisoners serving prison terms, do not have the full legal rights of the general public. While you may still wish to get release forms signed by them if you’re filming in a prison, ultimately permission may rest on the shoulders of the prison’s warden. Do I need a release form to film at a legislative assembly building or State Senate/State House or city council? If you want to record public proceedings in a legislative assembly building, such as your State Senate proceedings or your city council session, you will not need to get release forms from officials who give speeches. You may however have to get special permission to film or access to the “media area,” depending on which assembly building you’re in. Some places may allow anyone to film, and others may only allow credentialed media to enter their press box for tripod setup and audio plug access. In other cases you may be able to get official recordings from town councils or State senates which record each session as a matter of public record. Inquire with the staff of whichever public council or state senate before you show up with a camera. Keep in mind that if you’re, say, a documentary filmmaker looking to distribute your work, just because you shouldn’t “have to” have a release form signed does not mean that a potential broadcaster won’t request that you have a release form for every person who appears in your film. Errors & Omissions Insurance (or E&O) is sometimes required from broadcasters before they will air a film, and the more release forms you have signed, the cheaper that insurance is likely to be. When do you need a release form for video? If the list of common circumstances above does not include the specific circumstance you’re interested in, we recommend getting a release form signed from the people you’re filming or videotaping anyway. 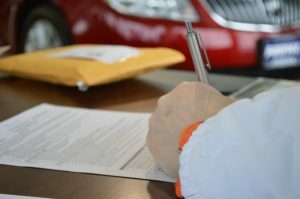 It generally only takes a minute or two to get signed and most people will be happy to sign a release form once they understand that you need one or else you may not be able to use the footage you are recording. Download release forms here.